The Anarchist FAQ - VII. Do anarchists have symbols & art? What are some generic anarchy symbols? What is the history of the Black Flag? Where does the circled-A come from? VII. Do you have symbols & art? Anarchists have used symbolism in our revolt against the State, the most famous of which are the circled-A and the black flag. Here we give the history of these iconic symbols and indicate why they were taken up by anarchists to represent our ideas and movement. This should be unsurprising since the anarchists mentioned above were all socialists of some type, and were part of the general socialist and labour movements. However, as mainstream socialism developed in the nineteenth century into the statist socialism of the revolutionary Marxists, anarchists developed their own images. 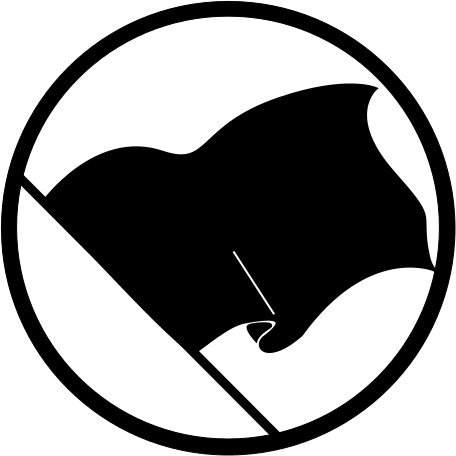 The most popular and well-known symbol is the cirled A. It is both easy to draw and easy to recognize. However, it is actually pretty new, dating from the late 20th century. The oldest symbols were flags. Both the black and red-and-black flags were first used by early revolutionary anarcho-socialists. The black flag was popularised in the 1880s by Louise Michel, a leading French communist-anarchist militant. From Europe it spread to America when the communist-anarchists of the International Working People’s Association raised it in their struggle against capitalism before being taken up by other revolutionary class struggle anarchists across the globe. The red-and-black flag of anarcho-socialism was first used by the Italian section of the First International and this had been the first to move from collectivist to communist-anarchism in October 1876. [Nunzio Pernicone, Italian Anarchism, 1864–1892, p. 111] From there, it spread to Mexico and was used by anarchist labour militants there before being re-invented by the Spanish anarcho-syndicalists in the 1930s. VII.A.1 - What is the history of the Black Flag? Why is our flag black? Black is a shade of negation. The black flag is the negation of all flags. It is a negation of nationhood which puts the human race against itself and denies the unity of all humankind. Black is a mood of anger and outrage at all the hideous crimes against humanity perpetrated in the name of allegiance to one state or another. It is anger and outrage at the insult to human intelligence implied in the pretences, hypocrisies, and cheap chicaneries of governments ... Black is also a colour of mourning; the black flag which cancels out the nation also mourns its victims the countless millions murdered in wars, external and internal, to the greater glory and stability of some bloody state. It mourns for those whose labour is robbed (taxed) to pay for the slaughter and oppression of other human beings. It mourns not only the death of the body but the crippling of the spirit under authoritarian and hierarchic systems; it mourns the millions of brain cells blacked out with never a chance to light up the world. It is a colour of inconsolable grief. But black is also beautiful. It is a colour of determination, of resolve, of strength, a colour by which all others are clarified and defined. Black is the mysterious surrounding of germination, of fertility, the breeding ground of new life which always evolves, renews, refreshes, and reproduces itself in darkness. The seed hidden in the earth, the strange journey of the sperm, the secret growth of the embryo in the womb all these the blackness surrounds and protects. Louise Michel, famous participant in the Paris Commune of 1871, was instrumental in popularising the use of the Black Flag in anarchist circles. At a March 18 public meeting in 1882 to commemorate the Paris Commune she proclaimed that the “red flag was no longer appropriate; [the anarchists] should raise the black flag of misery.” [Edith Thomas, Louise Michel, p. 191] The following year she put her words into action. According to anarchist historian George Woodcock, Michel flew the black flag on March 9, 1883, during demonstration of the unemployed in Paris, France. An open air meeting of the unemployed was broken up by the police and around 500 demonstrators, with Michel at the front carrying a black flag and shouting “Bread, work, or lead!” marched off towards the Boulevard Saint-Germain. The crowd pillaged three baker’s shops before the police attacked. Michel was arrested and sentenced to six years solitary confinement. Public pressure soon forced the granting of an amnesty. [Anarchism, pp. 251–2] August the same year saw the publication of the anarchist paper Le Drapeau Noir (The Black Flag) in Lyon which suggests that it had become a popular symbol within anarchist circles. [“Sur la Symbolique anarchiste”, Bulletin du CIRA, no. 62, p. 2] However, anarchists had been using red-and-black flags a number of years previously so Michel’s use of the colour black was not totally without precedence. VII.A.2 - Where does the circled-A come from? This is not the earliest sighting of this symbol. 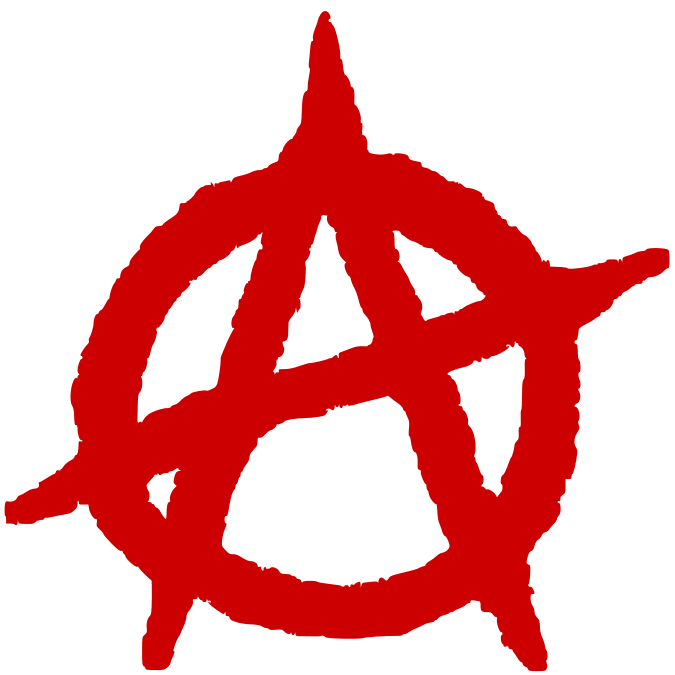 On November 25 1956, at its foundation in Brussels, the Alliance Ouvriere Anarchiste (AOA) adopted this symbol. Going even further, a BBC documentary on the Spanish Civil War shows an anarchist militia member with a “circled-A” clearly on the back of his helmet. Other than this, there is little know about the “circled-A“s origin. All of the various schools of anarchism have their particular symbols. Many are variations or colors of the circle-A symbol. For example, green anarchism uses a green circle-A, while anarcha-feminism and queer anarchism often use a pink one. Another variation is to use an additional symbol within the circle, such as a dollar sign for anarcho-capitalism, or a black cat or hammer for anarcho-syndicalism. The "color codes" are similar for flags. The red and black flag stands for anarcho-communism or (with a black cat sometimes added) for anarcho-syndicalism. A green and black flag stands for green anarchism, while a gold and black flag stands for anarcho-capitalism. Orange and black is associated with mutalism. One can find all these symbols and more by doing a web image search on "anarchism symbols."